How far in advance can I make a facility reservation? All reservations can be made as early as 1 year, 365 days, in advance starting at 8am on that day. For example, you can make a reservation for October 30, 2020 starting at 8am EST on October 30, 2019. Reservations made less than two-weeks in advance require the approval of the park manager before they can be made. How can I make a facility reservation or program registration? You can make a facility or program reservation online through our reservations website. You can also give us a call M-F 8am-4:30pm at our Headquarters office at 614-508-8111 and we’d be happy to assist you. Where can I find information on your facilities? You can view our list of facilities, facility amenities, and pricing on our reservation website. Do I pay for my facility fees up front? Yes, full payment is required at time of reservation. We accept all credit cards online and over the phone. Cash and check is accepted but it must be delivered to our Headquarters at 1069 W. Main St. in Westerville before a reservation can be made. Yes, if you’re a Franklin County Resident you receive a reduced rate for all of our facilities. Outside of the discounted resident rate we do not offer any additional discounts. Is there a waitlist for facility reservations? Cancellation rates for our facilities are so low that we do not offer a waitlist. You can continue to check online and if a cancellation is made it will automatically be updated as available on our online calendar. How much do your facilities cost? We have a variety of shelters and lodges with a wide range of amenities and associated prices. These can be viewed on the reservations website. To view a PDF that includes our entire pricing structure please click here. Can I view a facility before making a reservation? Absolutely! All of our indoor lodges have a virtual walkthrough on our website, seen here. If you’d like to view a facility in person please call the Park Ranger Cell Phone (numbers listed above) at the Park where the facility is located to set up a viewing appointment. Please note we cannot schedule appointments on days a facility is reserved by another group. What is your refund policy for facility cancellations or changes? You can cancel your reservation online through our reservation site. Simply sign in, go to your ‘my account’ tab and click on ‘cancellations.’ To change your reservation you can go to your ‘my account’ tab and click on ‘changes.’ You can also call us M-F 8am-4:30pm EST at (614) 508-8111 and we can change or cancel your reservation upon request. Please note, cancellation and change fees do apply. On the day of my reservation, how do I access the facility? A ranger will meet you and unlock your facility. When you make a reservation you will be asked to put in your estimated time of arrival. The facility will be unlocked and ready for you at that time. *Please note that all setup and cleanup must be done within the time period you have reserved. Early and late facility access will not be provided for setup or cleanup. Bounce Houses: These are generally not permitted in our parks. Petting Zoos: We do not permit any domestic animals except for cats and dogs. Generators: These are prohibited on park property. DJs: You are permitted to have a DJ at your event, but keep in mind that your music noise level is limited. Our noise regulation is that your music cannot be heard more than 50 feet from your reserved facility. Food Trucks and Game Trucks: These are not allowed in any of our parks without first applying for and receiving a special use permit (see below for the permit process). Outside Catering: You are welcome to bring any catering that you desire to any of our facilities. However, you cannot exchange money on park property, so please pay your caterer either prior to your arrival, or after your event off-site. Please keep in mind our alcohol policy (below), and our Food Truck policy (above). Alcohol: There are five reservable facilities where you are permitted to purchase an alcohol permit from us to give you the ability to have beer, wine, and champagne at your event. This alcohol permit is limited to Northern Shelter, Mansion Shelter, The Grove Lodge, Cedar Ridge Lodge, and Spring Hollow Lodge. You must apply for this permit 30-60 days prior to your event. The permit costs $250, with an additional $250 refundable security deposit. Your application must be completed no later than 30 days prior to your event. Applications started after this date will be denied. Alcohol is NOT permitted in any of our other facilities, at the above listed facilities without a valid permit, or in any of our non-reservable areas at any time. If you’re interested in applying for this permit please contact us at (614)891-0700 and we can setup an appointment to start the process. Alcohol at Blacklick Woods Golf Course Facilities: You can purchase beer, wine, and champagne directly from the Golf Course at least two-weeks in advance of your reservation for the Eagleview & Banquet Room facilities. No outside alcohol of any kind is permitted at these venues. Where can I find information on the programs you offer? I’d like to schedule a field trip for my school, an in-class visit, or other private group program. How do I schedule this? What are some general rules for your non-reservable shelters? No vehicle can be left in the park after hours. I’d like to have an event at a non-reservable facility, how do I go about doing that? Most of our parks have first come first serve shelters. These shelters are free of charge and cannot be held in advance or reserved. You are welcome to use these facilities at your convenience as long as the facility is not already in use by another group. Please note: you cannot arrive in the morning, set up decorations (or put up ‘shelter reserved’ signs), and leave. If another party is interested in the shelter and no person is currently occupying it, our rangers will remove any decorations and allow the group to utilize the shelter until their party has concluded. Can I bring my own grill, chairs, or tables to the park? Yes! You’re welcome to bring your own grill, either propane or charcoal to the park for your party’s use. Please note, you are not permitted to store your grill in the park overnight. Similarly, you’re welcome to bring in additional tables or chairs to accommodate for your group. Can I rent a tent for my event in the Parks? We do not permit any tents larger than 12×12 to be put up in the parks to prevent turf damage. Large-scale party-tents are not permitted. Tents that have walls are also not permitted, unless they are mesh or see-through. Can I temporarily put my hammock up in the parks? Absolutely! However, we do ask that you take particular care with the trees you tether your hammock between. Depending on the tree type you may have to provide a barrier to protect the tree. Which of your parks has a carry-in carry-out trash policy? Prairie Oaks, Scioto Grove, Walnut Woods, and Rocky Fork Metro Parks require you to carry out any trash you carry into the park. These parks have paper bag stations to assist you in removal. Can I keep my car in the park overnight? No, we do not permit any overnight vehicles in our parks. If your vehicle is left in the park overnight it is subject to towing. If your vehicle is disabled, or you have another extenuating circumstance please contact the rangers in the park to discuss the situation with them directly. Can I camp in the parks? 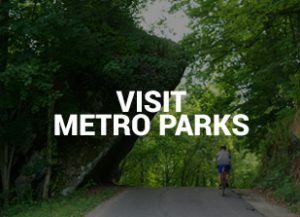 We do not permit any overnight camping in our parks with the exception of our REI backpacking trail camp sites at Scioto Grove Metro Park with a reservation. Backpacking is free at these locations and reservations can be taken by calling 614.539.3339. Backpacking registration opens April 1. Backpacking starts April 12 and 13 and is available every other weekend (Friday and Saturday nights), through to the end of October. No other overnight camping is permitted in the parks. Can I collect berries, mushrooms, nuts, firewood, or wildflowers in the parks? We do not permit any collection or removal of any plant, mineral, or live material anywhere in the Metro Parks. Can I make a campfire in the parks? No, we do not permit fires or fire pits anywhere in the parks outside of designated grills or Metro Parks established fire pits. Can we feed the ducks, geese, or other animals in the parks? We prohibit the feeding of wildlife in our parks. Feeding bread or other items to ducks and geese is bad for their digestion. It fills them up on food that has very low nutritional value, which can be harmful to their health. Feeding geese or other birds can also disrupt their normal migration patterns, which can lead to potential harm to their overall health. 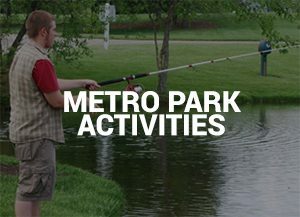 Can I go swimming in the Metro Parks? We do not permit swimming in any of our parks waterways or ponds. Where can I bring my dog or cat in the parks? Domestic dogs and cats are welcome in your Metro Parks. We do ask that your furry friends are on a leash at all times, unless inside a dog park or on our designated off-leash trail at Rocky Fork Metro Park. Pets are permitted in all public picnic areas and outdoor shelter houses. To view our pet-friendly trails, dog beaches, and dog parks please click here for additional information. I lost a personal item in the park; do you have a lost and found? Absolutely! Each park maintains their own lost and found. To see if your item has been located by our staff or turned in by another member of the public you’ll want to contact the Ranger at the park where your item was misplaced (Park Ranger cell phones are listed below). If your item has not yet been located, the Ranger can record your information and call you when it’s found. Some of your parks close at ‘dark,’ what does this mean? 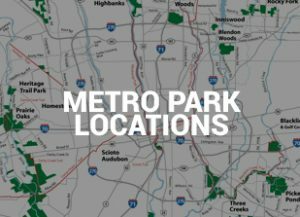 At Metro Parks ‘dark’ is defined as 30 minutes after sunset. 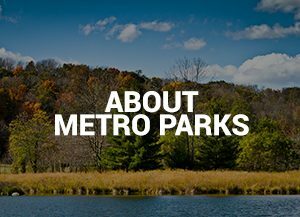 Is there anywhere I can hunt in the Metro Parks? We have designated public hunting areas at our Battelle Darby Creek Metro Park. This 800-acre area is open for small game, deer and waterfowl hunting in accordance with all Ohio DNR and Metro Parks rules and regulations. To view a map of these hunting areas please click here. Do you permit the use of drones in your parks? Currently, we only allow drones at one of our cut fields at Scioto Grove Metro Park (when entering the park turn right at the roundabout, the field is immediately on your right). Up until very recently drones were not allowed in any of our parks per Park Rule 19.0, but we are using Scioto Grove as a test location. You can apply for a special use permit to fIy drones outside of this designated area, however these are granted on a case-by-case basis. I want to host a 5K or other special event in your park. How do I go about doing this? To host a special event, 5K, or multiple events, you’ll need to submit a special event request form. We start accepting applications for the 2019 year on December 1, 2018. To view the form please click here. When you’ve completed the form please send it to Don Yablonski, our Manager of Park Operations, yablonski@metroparks.net. He reviews all applications and will follow-up with you regarding your request based on our date and park availability. You can apply for a special use permit to gain an exception to a park rule. To apply for a special use permit, please email our Park Manager of Operations, Don Yablonski at yablonski@metroparks.net. These permits are granted on a case-by-case basis. How can I contact the park rangers? The ranger cell phone number is posted at all bulletins and signs around the parks. For your convenience here’s a list of each ranger number, and the number to our Metro Parks Dispatcher. I’d like to purchase a commemorative tree or bench. How do I purchase one? Memorial benches and trees are a wonderful way to commemorate loved ones. The Friends of Metro Parks manage the tree & bench program. To view more information and to download the program brochure please click here. Where can I have my wedding in the Metro Parks? If you’re interested in hosting your wedding and/or reception in the Metro Parks we have a number of options that may be of interest to you. You’re welcome to have your wedding at any of our reservable facilities as long as you adhere to our facility regulations and facility capacities. Our reservable facilities range in size from 45 people to 175 people permitted. Our facilities also have a wide range of included outdoor space. You can host your wedding or reception at our non-reservable first-come first-serve shelters at no cost, but keep in mind these cannot be reserved ahead of time, and are subject to occasional closure for program use. How do I go about having my wedding ceremony at Inniswood? Weddings and wedding photography are permitted in the Rose Garden. It’s available on a first-come, first-serve basis. There is no fee for holding a ceremony in the Rose Garden and it cannot be reserved. Group size is limited to 50 people or less including the wedding party. No chairs, runners, or decorations can be brought into the garden. We suggest having a backup location as the Rose Garden doesn’t have shelter in the event of inclement weather and there is no other location on the grounds where a ceremony can be held. To review all Inniswood wedding restrictions please visit their site here. Weddings at Homestead Metro Park. Weddings are permitted at any of the reservable facilities at Homestead. There are a few things you’ll want to keep in mind when booking these facilities. The Covered Bridge does not permit any tables or chairs. If you have a wedding ceremony here it is standing-only. The Amphitheater, an open grassy space, is available to rent for ceremonies but please keep in mind tables and chairs are not provided at this facility. If you reserve the Lakeside Pavilion only the shelter house is included in the rental. The grassy hill outside of the facility is a first-come first-serve space that does not permit tables and chairs. We have a wide variety of facilities that can be perfect for your nuptials and reception celebration! If you have specific wedding questions we would be happy to discuss our options with you in depth! For specific information or facility availability please give us a call at (614)508-8111. I heard you had wedding packages at The Grove and Eagleview facilities, what do those include? We offer wedding packages at Eagleview and The Grove that include 4 hours of setup on Friday night and 10 hours on Saturday for your wedding and reception. This package is $1200 at either facility, and you get to pick the hours on each day that best fit your wedding schedule. To book wedding packages please give us a call at (614)508-8111. If you have a wedding with a guest count that exceeds our largest facility capacity (Eagleview, 175 people) please give us a call and we can talk to you about our combination Eagleview-Banquet Room wedding packages.